Having full, plump lips is often considered a sign of beauty and youth, however, many of us choose to have lip injections or lip augmentation treatments for other, more personal reasons. Whether you were born with thin lips or your lips are thinning due to the natural aging process, lip injections are a popular way to enhance them. At our clinic, we use natural fillers to keep your lips plump for months at a time. Every year, thousands of people undergo successful lip enhancement and are pleased with the results. Juvederm Volbella with lidocaine is a lip filler that we use at our clinic. It’s designed for less swelling and optimal duration, and uses a smooth gel without particles to give a natural look and feel. It’s dedicated to the lips and mouth area and is selected to enhance lip volume, redefine lip shape and to treat vertical lip lines and depressions at the corners of the mouth. Lidocaine is a local anaesthetic which helps make the treatment process comfortable. It reduces any discomfort that may be experienced during treatment and the effects of treatment are apparent immediately. Because this facial filler uses Vycross technology, you get longer lasting results from a single treatment (up to 12 months), minimal swelling after treatment and a smooth and natural lip enhancement result. Treatment is quick, convenient and the results are instant, restoring volume and plumpness and working to rehydrate the tissue under your lips. 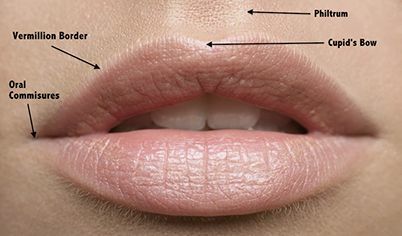 Get to know your lips! Identifying areas of your lip shape that you want improved or enhanced can be a tricky job if you are not sure what’s what. Different patients have different needs. Juvederm Volbella with Lidocaine is a versatile option for both younger and older patients. Depending on your expectations and requirements, this lip filler can be used to tailored smiles, adding volume and replenish lost volume and definition. Every person has a different set of lips with different shapes. Some have thick lips, others have thin lips, knowing which type you have will help you decide what kind of result you are looking for. Below are five lips shapes to help you identify your current lip shape before booking your consultation. A highly contoured lip shape, with defined cupids bow and average volume. Full volume lips that are highly pronounced and project forwards. Thin, smooth in appearance, low volume with slightly increased volume on the top lip. Smooth, long and wide in shape, medium volume, broader cupid’s bow and slightly more volume on the bottom lip. Rounded, high volume in the central part of the lips, and a soft cupids bow. Results and Expectations: Less is More! Our senior nurse Debbie Mills is an artist at her job and believes natural and tasteful results are they way to creating masterpieces of natural beauty. During your consultation, your expectations will be discussed and she will advise the best volume to suit and respect your anatomy and facial structure. If you’re interested in this treatment we would like to invite you for a free consultation with us. Please call us on 01708 225555 or contact us to book an appointment.